Leslie Dodd was making connections at UT Martin before she began her course work her freshman year. She said, "I was chosen my junior year of high school to be in Governor’s School of Agriculture. I was here and I took classes and I just loved it. I felt that I really fit in Martin." She continued, "Because we were governor's school students, the [agriculture] department faculty was welcoming and helpful in everything they did for us." Dodd grew up in Brazil, Tenn. where she learned that she wanted to continue with her family's tradition in agriculture. "I worked in the fields with my dad when I was young. And I just always loved it," she said. 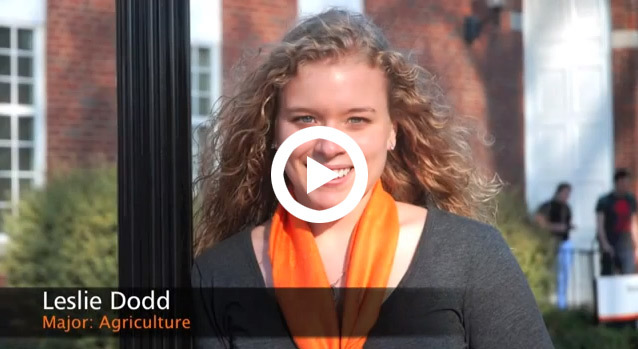 "There's was nothing I wanted to do besides be in agriculture. I didn't know until I was in high school that I wanted to go into veterinary medicine. But my love for agriculture kind of leads me that way, into animal science." Dodd is currently pursing a Bachelor of Science in Agriculture with a concentration in animal science. She is also a participant in the Agriculture, Geosciences, and Natural Resources Fellows Research Program. This departmental honors program provides her with additional preparation for pursing a graduate education or can help her to qualify for a professional school. "The Fellows Research Program is a program for students [studying agriculture] who have excelled academically. It's a series of classes that you take where you pretty much learn how to do a large research project. You do every step from writing a paper to analyzing data. And it's in order to help those who are going to grad school or professional school," Leslie said of the program. Last semester, Leslie's fellows class discussed the effects of a hay steamer when used on bales of hay that had been sitting for a while. Dodd elaborated on her studies, "What a hay steamer does is it takes the hay and sterilizes it. It's more beneficial for farmers who have a smaller number of animals because most of those farmers keep the hay and it gets mold on it. Eventually, you have to throw them out. But with the hay steamer, you can put the hay in it and you can have a longer shelf life for the hay, and it is still good for your animals." Dodd is on track to graduate in May, and this semester she is working to complete her Fellows’ research project. Her work last semester will help her as she continues to study and research the hay steamer's ability to sanitize sitting hay as she applies her findings to her final project. 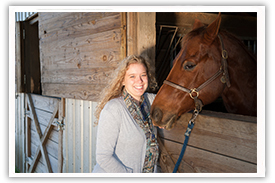 "As a student here at UT Martin pursuing agricultural interests, there are unlimited possibilities in what I can do. From the classroom lectures to the experiential learning opportunities, I've discovered how broad the field of agriculture is and learned that there is no limit to what I can do," Dodd proudly stated. All of Dodd's hard work at UT Martin will pay off as she continues her pursuit of studies in veterinary medicine.